Warhammer 40.000 is a rather famous miniatures wargame developed by Games Workshop. The box "Battle for Macragge" is the (fully-packed) introduction boxed set for this game, which is settled in the future in a dark and grim science fiction world. You have anything in there which is needed to start fighting with Space Marines and Genestealers. The box is huge and full of miniatures (Space Marines, an Imperial Pilot, Termagants and Genestealers) and a lot of other stuff you need to start. Terrain pieces of a crashed Space Shuttle are included as well as dice, a scenario booklet and a Warhammer 40K rule book. You can also buy a special edition of "Battle for Macragge" where even paint and brushes are included, so you can start immediatly to prepare your miniatures. Warhammer 40K is about tabletop wargaming in a dark future age. "Tabletop wargaming involves two or more players fighting for dominance over a replica battlefield, with armies of painted miniature soldiers representing troops, artillery, and powerful machines of war." And that is basically what you do - you paint your miniatures and prepare them for the battles, afterwards you set-up the pieces and play through the missions provided. Each mission will add some new elements, so you will end up knowing about the rules quite well. The mechanisms of moving and fighting are not too complex, and this additionally ensures lasting fun with the system - as the missions usually also play rather quick. 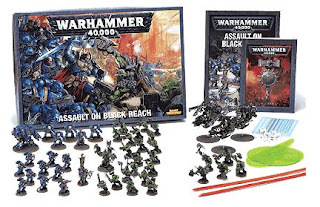 This boxed set (being just the tip of the iceberg of the Warhammer 40K galaxy) is a great opportunity to find out whether you like tabletop wargaming in general (and especially Warhammer 40K) or not, without spending lots of time and money. You can try to paint the plastic miniatures and realise that it is not too difficult (if your expectations are not that high), even if you always thought you have no talent for that. I really did like the painting, and I'm looking forward to prepare terrain boards on my own. 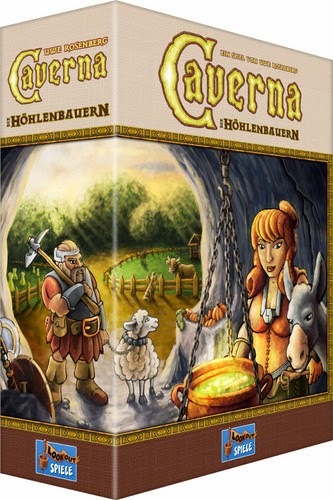 The gameplay is solid stuff and is fun, especially if you are playing with people who don't argue about every decision that is taken. Decide for yourself if Warhammer 40K might be the spare time activity of your choice, in my opinion it's definitely worth it. 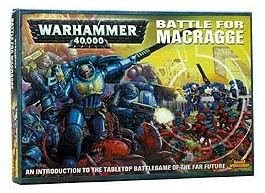 From the publisher: The Battle for Macragge is a great way to get started with Warhammer 40,000! This box is packed with all sorts of great stuff to introduce you to the grim darkness of the far future. Included are 10 Termagants, 6 Genestealers, 8 Spore Mines, 10 Space Marines, an Imperial Pilot, and a set of crashed Imperial Aquila Shuttle terrain pieces. Also included are dice, templates, a Battle for Macragge Getting Started book, and a digest-sized complete Warhammer 40,000 rulebook – the perfect size to fit into a figure case as you head out to a tournament or game!